Filing a Chapter 7 bankruptcy in Westchester/Bronx offers people the opportunity for a FRESH START. The Law Offices of David J. Babel, Esq., P.C., provides experienced bankruptcy attorneys with a combination of nearly 60 years of bankruptcy representation in the United States Bankruptcy Court, Southern District of New York, White Plains Division, New York Division and Poughkeepsie Division. The goal is to provide debt relief through zealous, diligent, competent, and compassionate representation, maximizing financial rehabilitation for individuals in financial distress. Say YES to keeping your assets; Yes to a FRESH START! How Can a Westchester/Bronx Chapter 7 Attorney Help With Debt Relief? 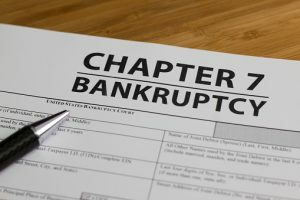 Chapter 7 is a bankruptcy generally used as a means for individuals to completely wipe out most debts in a legal proceeding conducted under the jurisdiction of the United States Bankruptcy Court. As a general rule, most Chapter 7 bankruptcy cases are no asset cases wherein creditors do not receive any money as payment for those debts listed in the bankruptcy schedules and the debtor is relieved from any obligation of paying back those creditors. While it is very common for debtors to be relieved of all debt during a Chapter 7 bankruptcy proceeding, there are certain debts that cannot be discharged, such as recent government taxes with special rules to satisfy, student loans (except in a special proceeding with an extraordinary burden to establish hardship), child support, fraud, alimony, and other specific debts. Consult with a Westchester/Bronx Chapter 7 attorney for a complete list of debts that may or may not be dischargeable. Under the new bankruptcy law, effective October 17, 2005, there are a number of additional requirements to satisfy in order to be eligible to obtain a discharge of your debts in a Chapter 7 bankruptcy, including passing a means test or income test. For individuals with income too high to pass the means test or property that is not exempt or protected under bankruptcy rules, a Chapter 13 bankruptcy filing may be appropriate. Consult with a Westchester/Bronx Chapter 7 attorney to discuss all eligibility requirements, including the means test and property exemptions to protect your assets when filing for bankruptcy. How Does Filing for Chapter 7 Bankruptcy in Westchester/Bronx Affect My Credit? When filing for bankruptcy, most people are quite concerned with how it will affect their credit. How your credit will be impacted depends upon your credit standing at the time of the filing. If your credit was already significantly hurt by delinquency at the time of filing, it will in time go up after bankruptcy. If your credit was good, your credit will be affected negatively by filing for bankruptcy. Although a notation of bankruptcy will remain on your credit report for a period of 10 years if you file for Chapter 7 (but only 7 years if you file for chapter 13), it is possible to repair your credit much sooner after you have filed for bankruptcy. Many clients restoring their credit within a 2-4 year period. Filing for bankruptcy will not tarnish your credit forever. Your Westchester/Bronx Chapter 7 attorney can help direct you in the steps to rebuild your credit. What Are the Hearing Procedures for Chapter 7 Bankruptcy? If you live in Westchester/Bronx (Yonkers, Mount Vernon, New Rochelle, Port Chester, and White Plains) or Rockland County, the Chapter 7 hearing is conducted at 300 Quarropas Street in White Plains. Generally, you are required to appear with your attorney for one hearing. Also, typically, no creditors appear at this hearing. This hearing will take place in the presence of a Trustee who will ask questions concerning your income and expenses and your assets and liabilities. The questions should be quite familiar to you if you were represented by competent legal counsel. The hearing usually lasts 5-10 minutes and the Trustee typically issues a report to the Court shortly thereafter so that a formal order signed off by a Judge may be issued within 3-5 months, stating that the debts have been officially discharged. A competent Westchester/Bronx Chapter 7 attorney will prepare, with your assistance, all of the appropriate paperwork to ensure that full disclosure has been provided and all required documents have been submitted. How Much Does it Cost to File for Chapter 7 Bankruptcy Through a Competent Westchester/Bronx Chapter 7 Attorney? The Law Offices of David J. Babel, Esq., provides quality legal representation at reasonable fees in a payment plan and we fully serve the Hispanic community. Hablamas Espanol. If you are suffering from the burden of creditors calling your home and office, we can help! After you have retained us to represent your bankruptcy case, you can notify all of your debtors to contact our firm for all future communications regarding your debt. Once you have retained a Westchester/Bronx Chapter 7 attorney, the Fair Debt Collection & Practices Act prohibits most creditors from contacting you to discuss your debts after disclosure to your creditors that an attorney has been retained to represent you in a bankruptcy proceeding. Many of our client receive a financial recovery of up to $1000 for violations by the creditors. We carefully review all the collection letters for violations and also carefully review your credit report for improper remarks about the status of your debt. Contact us today to discuss all of your options with an experienced Westchester/Bronx Chapter 7 bankruptcy attorney.